Student Voice is going on tour to work with high schools across the U.S. to identify student-centric education reform solutions. Students throughout the U.S. are participating in workshops, storytelling lessons, and roundtables, learning how to affect change in their own school. Students at each school will create an action plan, partnering with teachers and administrators to create change in their school. These changes benefit student learning outcomes. Stephanie, 16, of New Milford, New Jersey believes there are factors in her school that are not best preparing students for lives post-graduation. 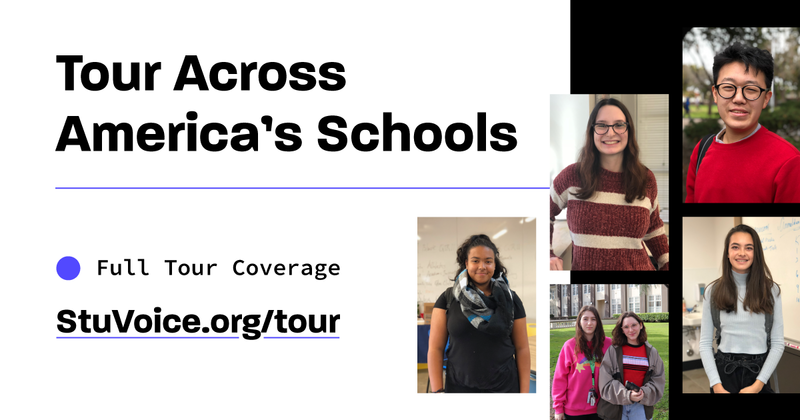 Student Voice’s “Tour Across America’s Schools” is aimed at providing a platform for students to change their schools and communities. Megan Simmons, Director of Strategy at Student Voice, is leading the tour efforts. High school students, teachers and administrators interested in scheduling a Tour Across America’s Schools stop should request a visit at StuVoice.org/tour. A visit comes at no cost to the school. Student Voice is the nation’s largest by-students, for-students 501(c)(3) nonprofit organization inspired by the premise that education should work for all students. We believe that every student deserves quality civic education—and a direct platform to impact decisions that affect their lives. Through action-based civics programs, Student Voice leads and strengthens the movement of young people taking action on issues that most impact their education. For more information about Student Voice and joining the student voice movement, visit our website at StuVoice.org and follow @Stu_Voice and #StuVoice on social media.